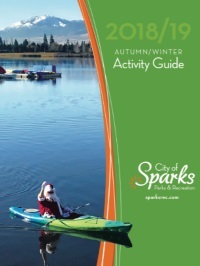 The Sparks Parks and Recreation Department provides activities for all ages and abilities, including sports leagues, camps, competitions, aquatics, arts, dance, community classes, senior outings, kids out-of-school programs, activities for people with disabilities, special events and more. Recreation facilities include three community centers, two outdoor swimming pools, and two sports complexes. In addition, there are over 50 public park sites in Sparks where you can make your own fun. There is a really nice online version of the Sparks Activity Guide. You can read it on the website or download a copy to your computer. I believe paper copies are available at Sparks recreation facilities. To find out which facilities have copies, call (775) 353-2376. Call the office for information about youth scholarship assistance for program fees, available to children, seniors, and those with disabilities who cannot otherwise participate due to limited finances. Parks and Recreation in Reno - There are lots more recreational opportunities available from the City of Reno. To learn more, go to "Reno Parks and Recreation Guide."